Clayton Barney Vogel was born September 18, 1882 in Philadelphia, Pennsylvania. He was the son of Theodore Knight Vogel, Captain of the 198th Pennsylvania Infantry, who served during the Civil War and was mustered out on June 3, 1865. Captain Vogel was an original Companion of the Pennsylvania Commandery of the Military Order of the Loyal Legion (Loyal Legion), having been elected November 7, 1883 (Insignia No. 2943). Major General Clayton Barney Vogel, U.S. Marine Corps, became a member of the Loyal Legion on November 5, 1913 in the Commandery of the District of Columbia (Insignia No. 16993). Major General Vogel had a very interesting and adventurous career, which began with his graduating from Rutgers University in 1904, being a student at the School of Application, Annapolis 1904-05, and later graduating from Georgetown University Law School. He was commissioned a Second Lieutenant in the Marine Corps in 1904 and retired in 1946 after 42 years of continuous service. During his military career, he served in such various posts and places including: (1) serving with the Legation Guard, Peking, China 1906-09, (2) serving as a Special Aide to White House 1911-12, (3) serving on board the USS Nebraska 1912-15, (4) serving as Commanding Officer, Marine Detachment, USS Pocahontas 1919, and (5) serving in the Philippine Islands, the Canal Zone, Cuba, Haiti, and various other places in this country, including an assignment to the Judge Advocate's Office from 1926 to 1929. He was appointed to a temporary rank of Brigadier General in 1937 and a permanent rank of Brigadier General in 1939. In 1941, he was promoted to Major General and on February 21 of that year he assumed command of the newly formed 2nd Marine Division, and in November of the same year became commanding general of the 2nd Joint Training Force, later designated as the Amphibious Corps, Pacific Fleet. In October 1942, he departed for the South Pacific, and assumed command of the newly organized First Marine Amphibious Corps, with headquarters at Noumea, New Caledonia. General Vogel was instrumental in the use of "Navajo Talkers" in order to communicate without the Japanese being able to translate the messages. In August 1943, General Vogel returned to the United States, becoming Commanding General of Fleet Marine Force, San Diego Area, at Camp Elliott. In May of the following year, he assumed his final command in the Marine Corps, as commanding general, Marine Barracks, Parris Island, South Carolina, from which he retired in January 1946. The General received many decorations and medals during his varied career from the United States Government, together with several foreign citations. General Vogel, better known to his intimate friends as Barney, was extremely proud of his connection with the Loyal Legion. He was always a member of the Commandery of the District of Columbia, where he served in many offices, and his last position was that of Commander in which capacity he served for several years. His loyalty and devotion to the Loyal Legion was only second to that of his first love, the Marine Corps. He was loved by all Companions of the Loyal Legion. He made the supreme effort and with the aid of the Commandant of the Marine Corps, traveled by automobile to Cincinnati, Ohio, where he attended the 79th Annual Meeting of the Commandery-in-Chief during October of 1964. At that meeting he was installed as Commander-in-Chief of the Order and he was looking foward to officiating at the 100th Anniversary of the Loyal Legion in April 1965 in Philadelphia, the city where the Loyal Legion was founded 100 years before. Commander-in-Chief Vogel died November 26, 1964 in Philadelphia, Pennsylvania. His funeral services were held in the Chapel at Fort Meyer, Virginia. 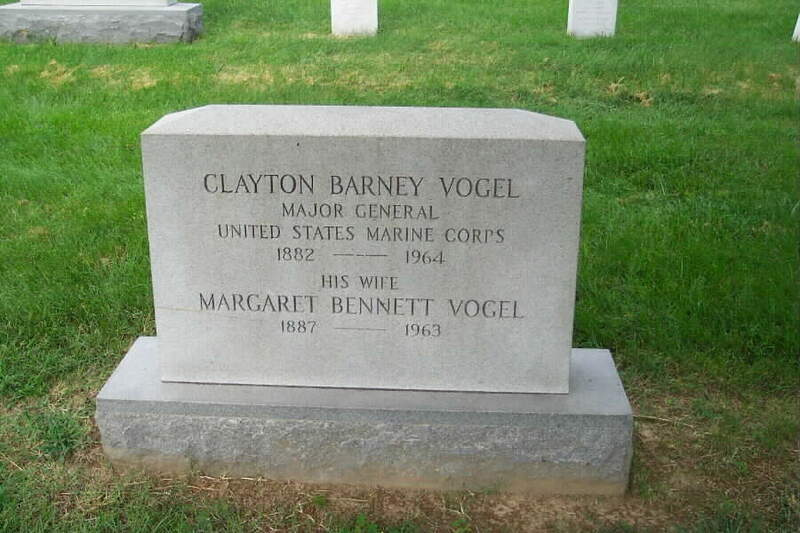 He and his wife, Margaret Jane Bennett Vogel (1887-1963), are buried in Section 30 of Arlington National Cemetery. Clayton Barney Vogel was born on 18 September 1882 in Philadelphis, Pennsylvania, and died in November 1964, in Philadelphia, Pennsylvania. 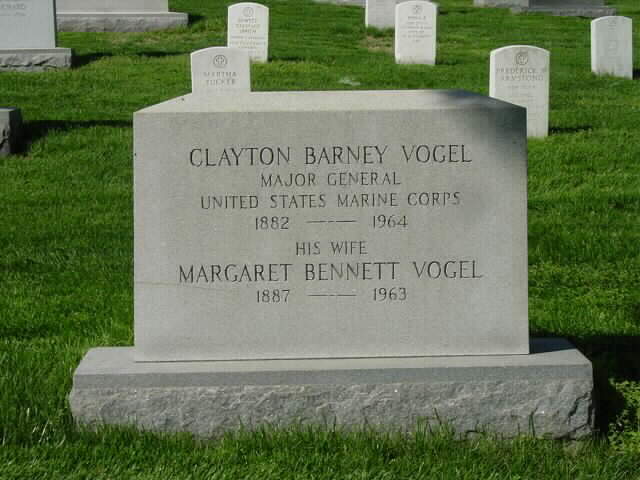 He and his wife, Margaret Jane Bennett Vogel (1887-1963) are buried in Section 30 of Arlington National Cemetery. General Vogel was a veteran of World War II and was instrumental in the use of "Navajo Talkers" in order to communicate without the Japanese being able to translate the messages. We are seeking information on these individuals. Should you possess such information, kindly contact the Webmaster. PHILADELPHIA, November 27, 1964 – Clayton B. Vogel, a retired Major General of the Marine Corps, died yesterday in the Naval Hospital here. He was 82 years old. General Vogel, a resident of Bedminister in Bucks County, retired in 1946 after 44 years of service. He enlisted in the Army in 1902 and was honorably discharged in 1904. Five months later be became a Second Lieutenant in the Marines. The Lieutenant went to Peking in 1906 and in 1911 became a special aide at the White House. He served at the Marine Barracks here and in Haiti, Caldwell, New Jersey and in Washington. He was promoted to Brigadier General in 1935. Two years later he was made a Major General and given command of the Second Marine Division, Fleet Marine Force, at Camp Elliot, California. 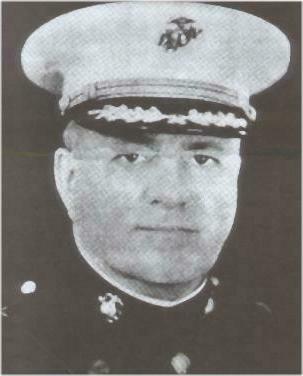 Six months later he was appointed to command the First Marine Division Amphibious Corps of the Pacific Fleet. In that post he saw nearly two years of action in the Pacific before returning to the United States in 1944. He became commander of the Marine Corps Barracks at Parris Island, South Carolina. He was the husband of the late Mrs. Margaret Vogel.